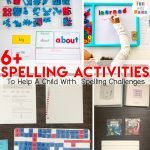 Are you looking for a homeschool spelling curriculum or want to fill in some spelling gaps that your child may have? 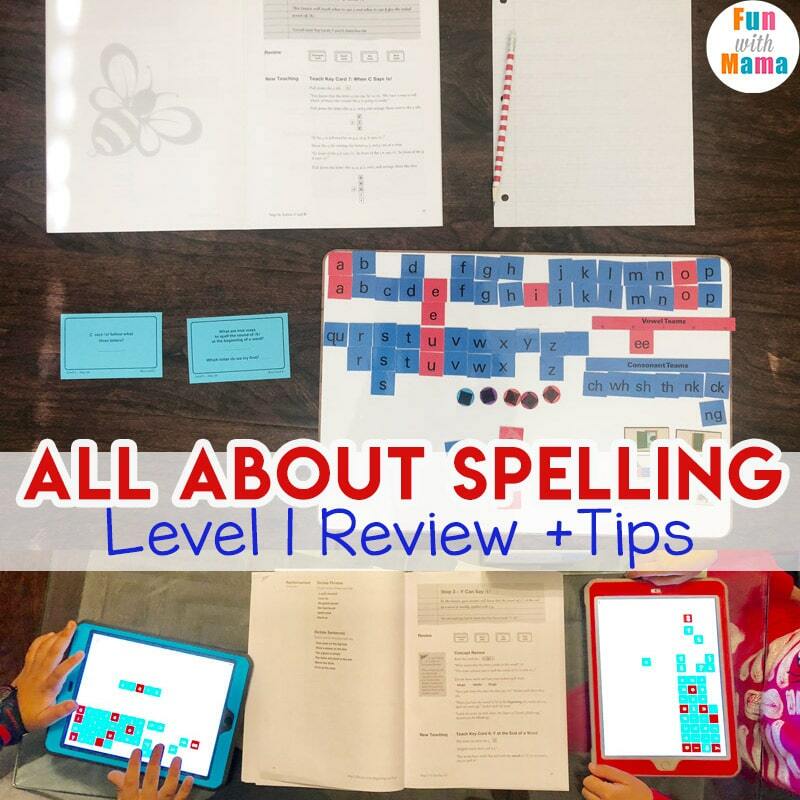 Then check out this All About Spelling Level 1 Review to learn more about this wonderful spelling curriculum. Please note that this blog posts contains affiliate links. This means that if you purchase from one of these links, at no charge to you, I will receive a small commission from the sale. All About Spelling is a scripted spelling curriculum. What does that mean? It means that it is literally an open the book and teach your child. Everything you need to say out loud to your child is written on the page making it as easy as possible for a parent to teach. 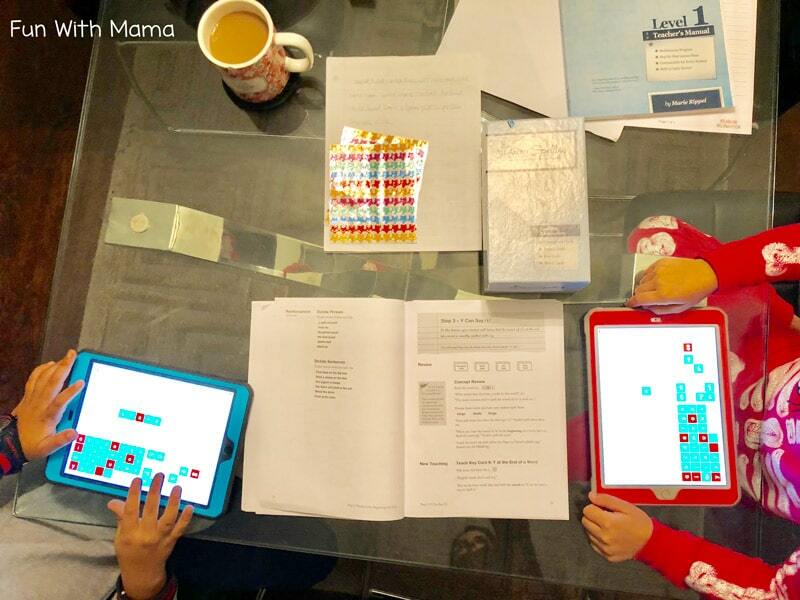 It teaches encoding skills, spelling rules, and multi-sensory strategies for spelling success. It is a 7 level program. 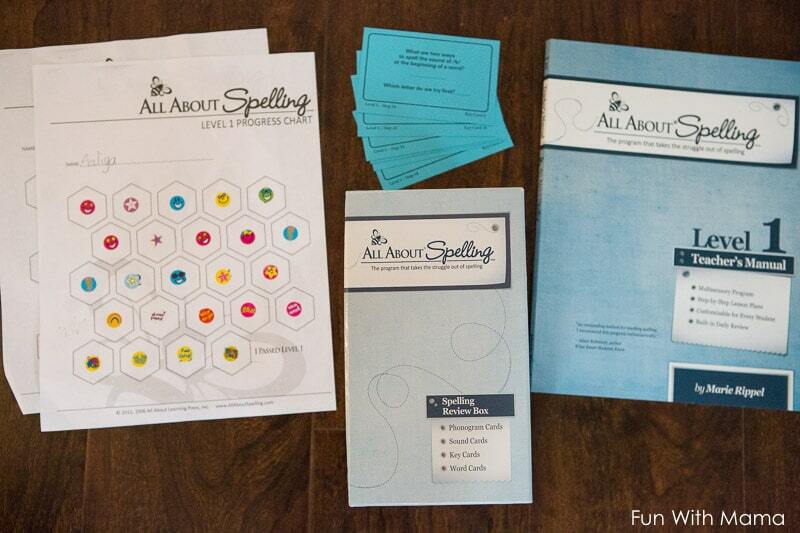 We purchased the All About Spelling All About Spelling Level 1 Deluxe Interactive Kit for Level 1. You can take a placement test to choose which level your child should go to, but I believe it is important to start at Level 1, no matter how old your child is. 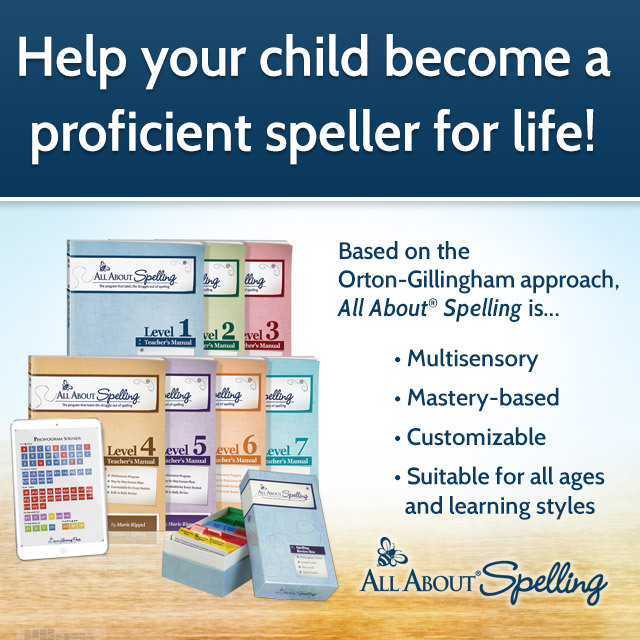 Level 1 is for beginning spellers (once a child is very comfortable with all their letters sounds), I’d say by around 1st grade BUT… it is also the place to start if you are just beginning the All About Spelling curriculum, even with an older child. Each level builds on the other, especially when it comes to phonemic awareness. The benefit that you will have, in teaching an older child is that you will likely zoom past most of the first level of All About Spelling while you fill in any gaps that your child might have. I can’t even begin to tell you how many things I, myself, have also learned by giving my children these lessons. All About Spelling is a multi-sensory program based on the Orton-Gillingham approach of learning. This means that it also works for kids with Dyslexia. Based on my own thoughts, I think that those with mild dyslexia can benefit from this program, whereas those with more spelling challenges would need to move on to Barton Reading and Spelling if this doesn’t work. Does that mean this program is only for kids with dyslexia? No. None of my children have dyslexia and have benefited from both All About Spelling and Barton. 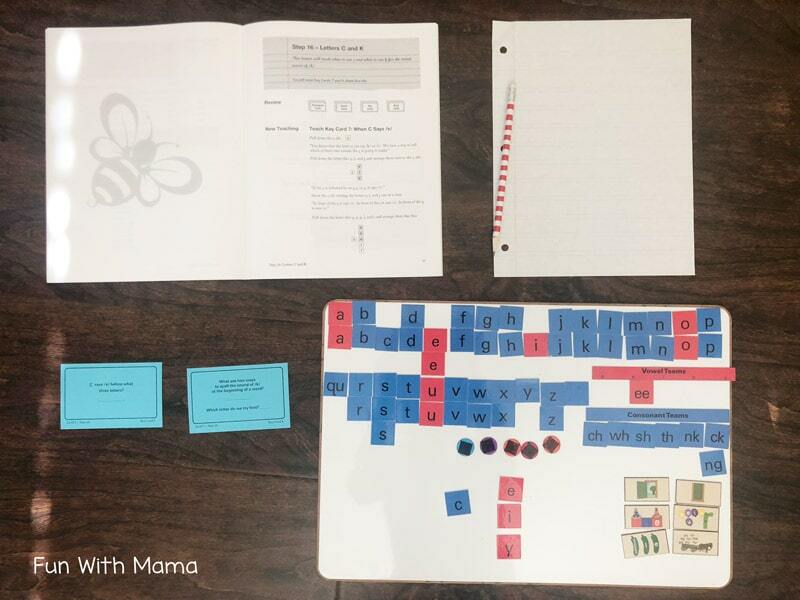 When you purchase the kit, you receive a teachers manual, phonogram cards, sound cards, key cards, word cards and magnetic tiles (that you pop out yourself). 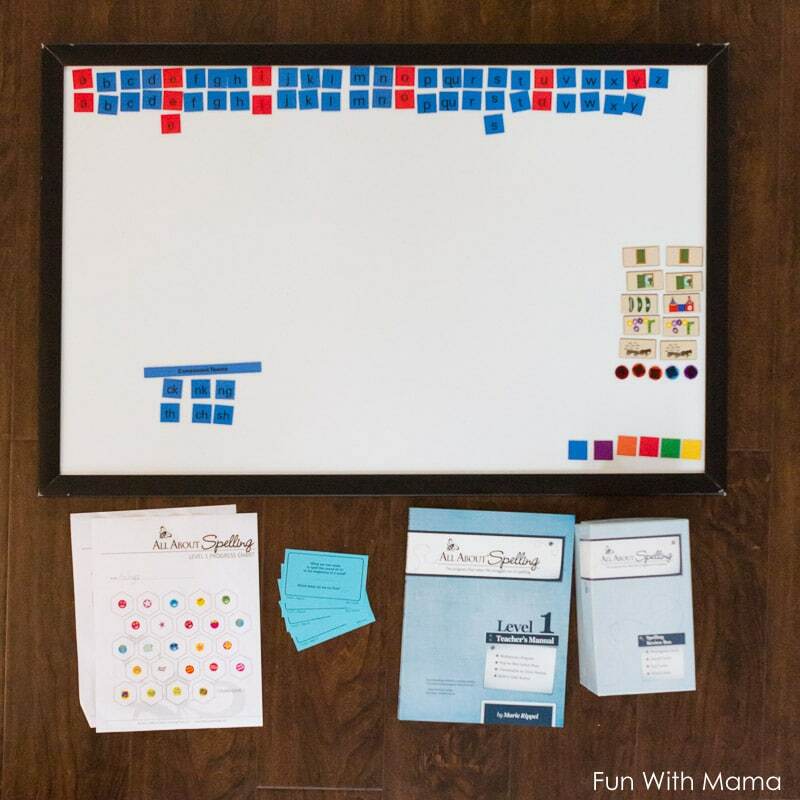 You will need to purchase a magnetic board if you would like to use magnetic tiles, but I’ll be honest that now that we found the All About Spelling iPad app, that has been our definite go to. My children hated having to put the letters back in the spots.. this made our lessons a tiny bit longer and distracted from our flow. Now that we have been using the iPad app, it is a lot easier to do the lessons. One swipe and all the letter tiles return to their rightful spots. And yes, that is my cup of tea… lol. I swear, somedays my tea time is far from relaxing.. it’s more of a drinking tea on the run time. Sips between lessons when eventually, it ends up being cold. 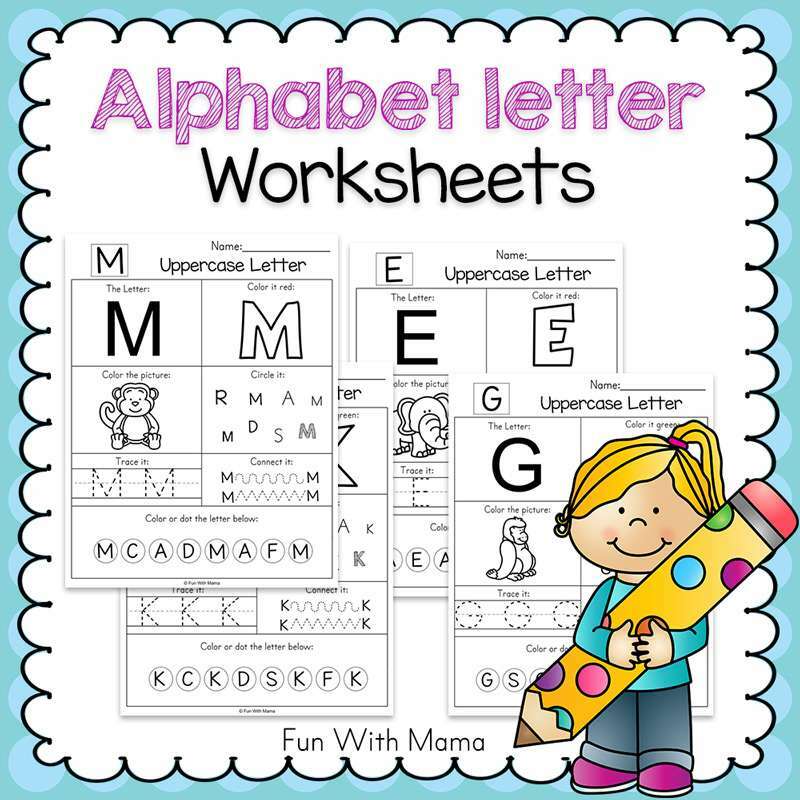 Each lesson begins with review, when teaching spelling, mastery is very important.. so the more you can go over spelling rules, all sounds alphabet letters make and all the key cards, the better your child will get at spelling. After review, you do the new teaching section (this is where your child learns a new phonetic rule), then children spell with tiles, then paper and then the adult dictates phrases. The lessons take about 10-15 minutes (especially when doing them with an older child.) 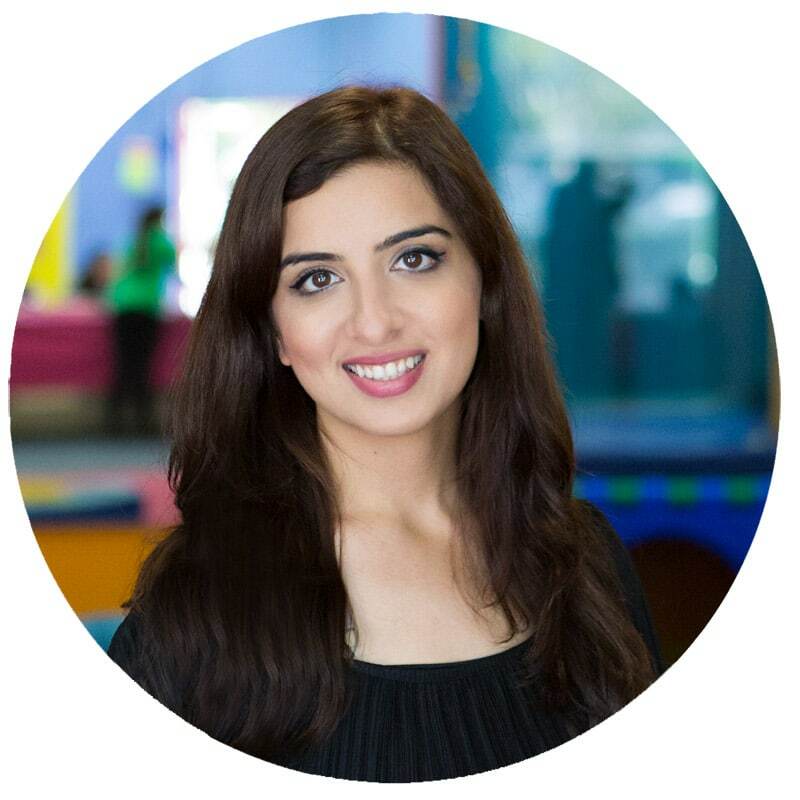 I haven’t tried the curriculum with a kindergarten or first grader… my last child is still in preschool, so I am eager to see how she does with it. 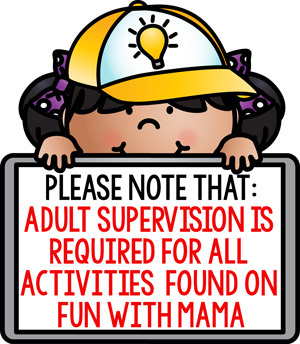 I have found that it is really important, if doing the program with multiple children, to do the lessons individually. I initially tried doing it with both my children at the same time and I found it really hard to see each child’s difficulties. They would pretty much be giving each other the answers. So I highly suggest you do a lesson individually. This allows a child to really take in what you are saying and helps gain a mastery of spelling rules. I have one child who All About Spelling worked great for… but I also have another child where All About Spelling wasn’t enough. It is important to note that EVERY child learns differently. What works for one child may not work for another. For one of my kids, Barton Reading and Spelling was the answer. For my other child, Barton would have been overkill… It would have taken too long with no necessity for it. I would start with All About Spelling first, and if it works great! If not, move on to Barton… just know that it is a stronger commitment. – iPad app is so convenient. – I like that it takes a short period of time. – All About Spelling is priced well. 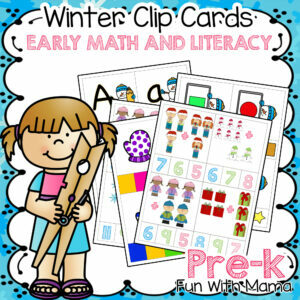 – If your child can learn quickly with the short lessons, they will progress in spelling very quickly. 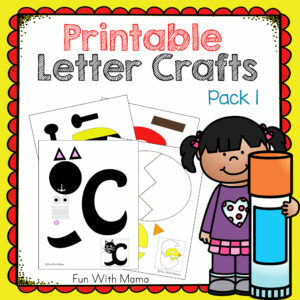 – Physical letter tiles work great for some learners. – Might move too fast to really be understood by your child. 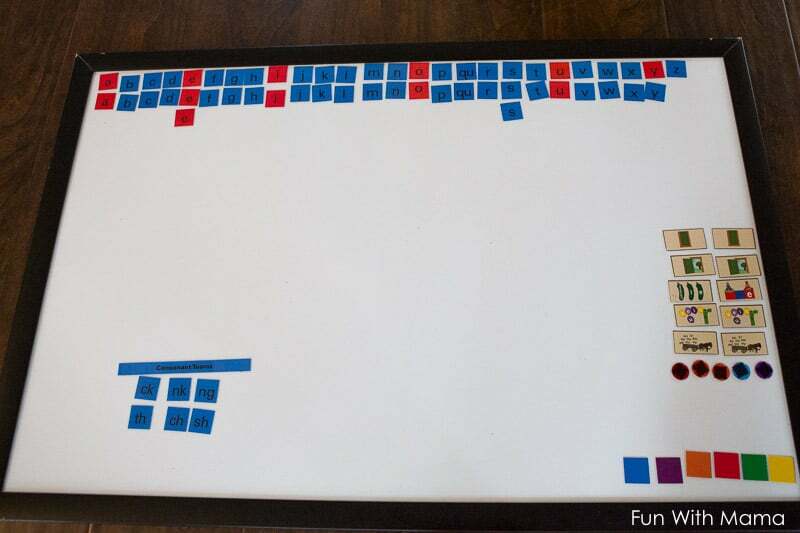 We started with a very large magnetic whiteboard but then I had difficulty finding a good spot for it in our house. Then we moved on to a smaller one, which i preferred. That is, until we found the App. 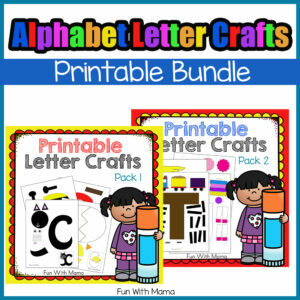 Basic Spelling Interactive Kit – $22.85 – that will be used in all levels – includes letter tiles, magnets, phonogram app and divider cards. 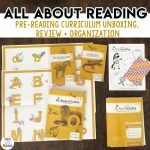 Deluxe Spelling Interactive Kit – $44.85 – Includes everything in the Basic Kit, plus Spelling Review Box and Spelling Tote Bag. Since I prefer the app instead of the tiles… if I was purchasing right now, I would purchase the All About Spelling Level 1 materials and then go a la carte on the other items that I would want. So I would buy the spelling review box, spelling divider cards and buzzing bee stickers. It’s a bit of savings that you can put towards purchasing the All About Spelling app. 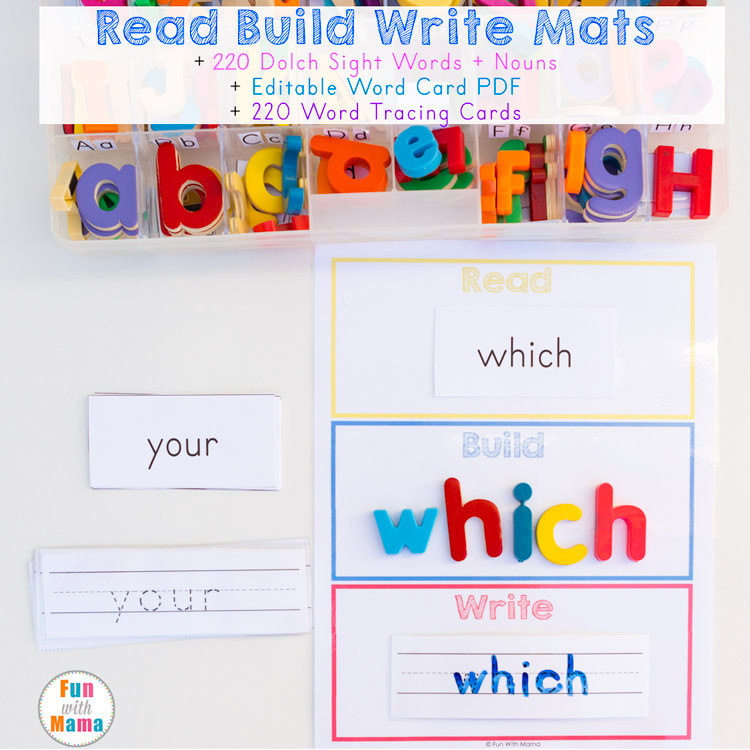 If you think your child would like to use the physical letter tiles (I definitely think you should try it) then I would get the All About Spelling Level 1 materials pack and the Deluxe spelling interactive kit because I really do like the box it comes with. Want to see what an All About Spelling Lesson plan looks like? You can see example lessons here. S, X and QU. This includes when the letter s should make the “zzz” sound. As you can see, A LOT of is covered in All About Spelling level 1. I had no idea why K was used instead of C in certain words to make the K sound. I just memorized words and have always naturally been a great speller. I was fascinated by many of the things I learned in All About Spelling and it truly makes me wonder why spelling isn’t TAUGHT in school. Why are these rules not covered? Sure, we get spelling tests… but one of my kids does AMAZING on spelling tests (almost always 100%) but then when it came to actually spelling those words correctly in an essay… it wasn’t happening. 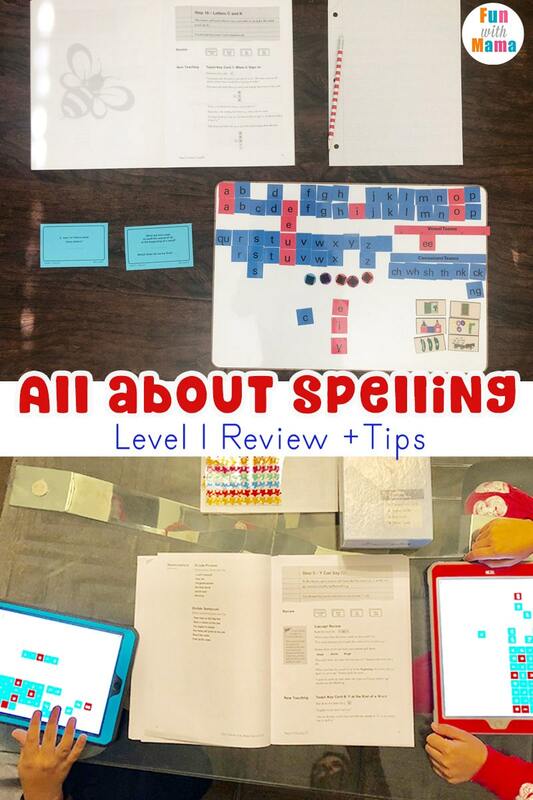 We are really happy with All About Spelling Level 1 and it will definitely be my first choice for when my 4/5 year old is ready to start a spelling program. Most likely in late Kindergarten/Early first grade. 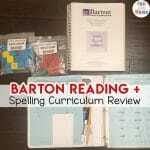 Have you tried any spelling curriculums? What were your thoughts? « 11+ School Lunch Ideas Tips, Tricks and Hacks!